Hampton Falls is in the extreme southeastern portion of New Hampshire, that part of the state that you pass through if you are driving from southern Maine heading towards Massachusetts. 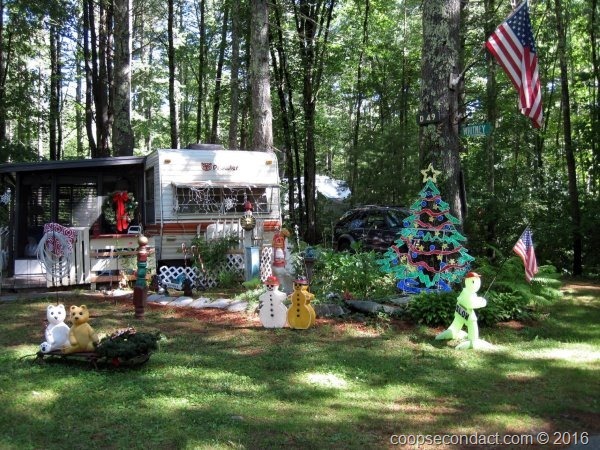 While here we parked at the Wakeda Campground located between Hampton Falls and Exeter. We were there during their “Christmas in July Event”. The town of Exeter, founded in 1638 is home to Philips Exeter Academy. This school, founded in 1781, is an independent institution for students in the 9th to 12th grades. If you want to prepare your child for an Ivy League college education, then Exeter might be a good choice. The tuition for day students is about $36,000 per year and around $42,000 for boarding students. 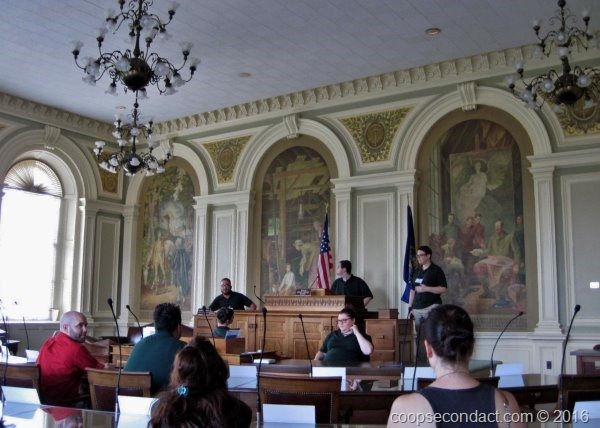 We drove north to New Hampshire’s capital city of Concord and toured the state house which claims to be the “oldest continuously used legislative chambers in America”. Opened in 1819, enlarged in 1864 and 1910, the house and senate still work from the original chambers. There are two interesting aspects of the New Hampshire government. They elect 400 state Representatives, one Representative for each 3,500 citizens, the highest ratio of representation in the world. If the US used a similar ratio we would have a House of Representatives with more than 80,000 members. The other interesting aspect of the New Hampshire government is that the governor has an Executive Council, consisting of 5 members elected from equally populated districts. This council, which is a hold over from pre-Revolutionary days must approve the Governor’s appointments, pardons and state contracts. They have no involvement in legislative affairs. From Hampton Falls it’s a short drive southeast to Hampton Beach. New Hampshire has a short but beautiful sea coast. Hampton Beach is a very nice, wide sand beach. As you drive north along the coast you are treated to a lovely coastline as you pass through North Hampton Beach, Bass Beach and Rye Beach.